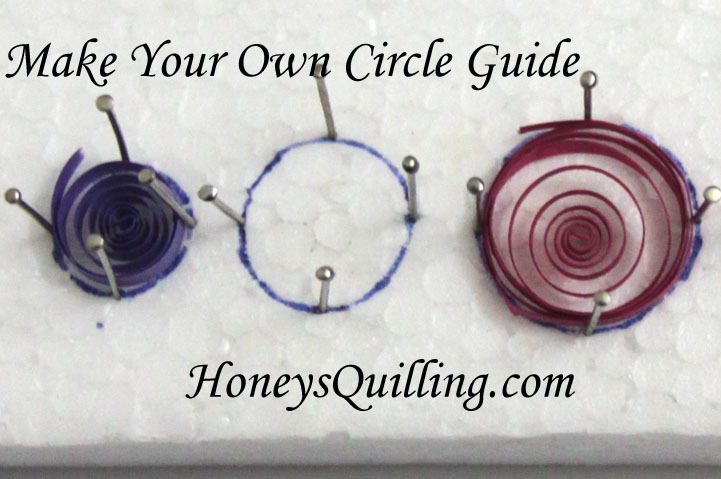 If you are just starting out with quilling you might not have a circle template yet. If you don’t want to wait until you get to purchase one, don’t fret, you can make your own with a few simple supplies! This is actually how I made my first circle sizing template, which I used for more than 5 years when I was a child before buying one of my own once I was in college and had a little income! Choose your round objects as per the size of circles you want to use. Here I am using two sizes of buttons and three Malaysian coins of various sizes. You may want to make a row of each size, but you only need one object as you can repeatedly trace it. Use your felt tip pen to trace each circle. Repeat by tracing each object as many times as you would like. For this tutorial I only did each one once. When finished, remove your circle objects, you are finished with them! 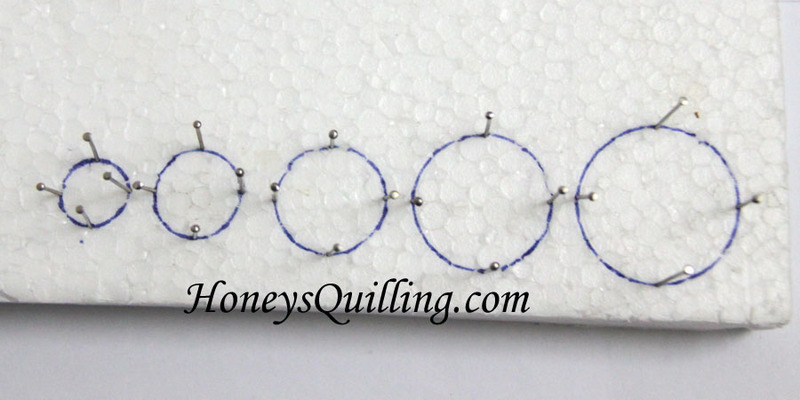 Now use your straight pins and place four around each of your circles – top, bottom, left, and right. That’s it, your board is ready to use! Use longer strips of paper for the larger circles, and shorter for the smaller. The more dense your board is, the more sturdy your final product will be. Here I used a semi-dense piece of styrofoam board from some packing material. It is 1.8cm thick (almost 3/4″) which is pretty thick. But it won’t last forever. If you are just using it as a temporary tool that is fine. But if you want it more permanent, find a thick corkboard as it will last longer. It is more tricky to remove your coils from this board because of the heads of the pins. To make it easier you can glue a circle together while it is on the template. When dry, remove one or two pins to easily remove the coil, then simply replace the pins. To make sure your circles are all the same size, make sure you place your pins in the same positions on each of the circles of the same size. For example, always put your pin IN the pen mark, or always put it outside or inside, whichever is your preference. I found it easiest to place the pins exactly in the outline that I drew. If you place your pins in the outline on one, and outside the outline on another, then your circles won’t be the same size. And join my Facebook page to keep updated on new posts, new quilling products, and inspirational quilling! Hi Honey, Your blog is just too good. thanks for sharing all the info. Sorry for my ignorance but I want to know, how do you decide that how big and how loose circle you wanna make. i am new to quilling and always end up making circles with different diameters. Is it just practice or is there a particular way to decide on. Hope I make sense. Hi, thank you for your comment 🙂 If you use a circle sizing guide you will get the same size circles each time. As for deciding which size circle you want, you can experiment and see which works for your design and then make more of those. Sometimes I have to make 2 or 3 different sizes before I decide which one is the one that works best in my design, then I make more of that size. Make sure to use the same length paper for each one you do – you will use longer paper for larger circles and shorter for the smaller ones. wow!! what a art mam!! It’s been years since I tried this & hope to try it again!